Link to last post of previous incarnation. Last edited by ramana on 16 Dec 2016 02:02, edited 1 time in total. I know the above author of the article. I don't know why she wrote this, because the title of the article and the content in the article have no relation. Currently, two naval LCA technology demonstrators are flying, but without any payloads. “These are just able to takeoff and land. Though this is a good learning experience, the naval LCA is too heavy for its current engine. It does not meet the thrust ratio required to take off with full weapon load,” a navy official told AIN. “In DRDO’s defense, it did take the Navy time to tell them whether they needed the aircraft to be designed for the ski or catapult,” said a representative of a leading OEM speaking with AIN on condition of anonymity. Last edited by ramana on 16 Dec 2016 02:03, edited 1 time in total. It is the papers and conclusions of a seminar in New Delhi held with mostly In officers serving and retired. ^^ Very curiously, IN Directorate of Naval Design does not provide designs to private shipyards - and in this case - a State Govt owned shipyard. They have to buy designs from bureaus, and that are often untested, and the shipyard lacks ability to test them. tsarkar wrote: ^^ Very curiously, IN Directorate of Naval Design does not provide designs to private shipyards - and in this case - a State Govt owned shipyard. All 3 shipyards faced financial problems and not product design issues per se. caused by time and cost overruns leading to delayed / non achievement of production milestones causing payment to be withheld which led to financial problems that impacted further progress. The delay / non achievement of production milestones was caused by issues in designs and implementing them in production. DND could've hand held them by providing designs. DND dealt with them.as vendors to own detriment. Any lessons learned now or same attitude persists? VELLORE: The country's first indigenous aircraft carrier will be commissioned by the Indian Navy by the end of 2018, said Rear Admiral Surendra Ahuja, assistant controller carrier project and assistant controller warship production and acquisition, Integrated Headquarters, Ministry of Defence (Navy). "The indigenous aircraft is currently being constructed in Cochin. It is expected to be delivered by the end of 2018," Ahuja told reporters on the sidelines of the passing out parade of 87th helicopter course of INS Rajjali at Arakkonam, Vellore. As many as 11 Navy and five Coast Guard pilots were honoured with wings on Friday. It would have the capacity to carry 30 aircrafts, fighter flights and helicopters, he said. The Indian Navy has sent a proposal to the central government, seeking its nod to build a bigger aircraft carrier, weighing 65,000 tonnes, with a capacity to carry 54 helicopters, fixed wing fighters and multi-role helicopters. "The proposal is currently with the government and is being actively considered. We are reasonably hopeful that we will get the approval very soon. It will be a game-changer," he said. He further said the Indian Navy envisaged procuring 57 more technology-based fighters. "The proposal is yet to reach the government. The Navy is doing the ground work for the 57 tech-based aircrafts," he added. The Navy has inducted eight P -8I (long-range maritime reconnaissance and anti-submarine warfare aircraft) in INS Rajali, he said and added that four more would be inducted soon. "We have signed the contract recently. It will be soon delivered," he said. Of the contract signed with Russia for a total of 45 MiG - 29K aircrafts, the Navy had received 41 and the remaining four would be received within a month's time said Ahuja. "Twelve Dorniers, eight Chetak helicopters, 16 advanced lightweight helicopters, 16 multi-role helicopters and many more on the anvil," he added. Earlier, speaking in the passing out parade, he said that the Navy and Coast Guard air arm have been expanding and were witnessing an unprecedented growth. Addressing the pilots who received the 'wings', he advised them to remember that flying is good when there is a right mix of discipline and dare. He asked pilots to know their machine, craft and men for a rewarding career in the force. The pilots underwent rigorous training for 21 weeks in flying and aviation at Indian Naval Air Squadron 561, the Helicopter Training School which has graduated 666 pilots for the Indian Navy and Coast Guard till date. The school was initially commissioned in Kochi on September 15, 1971 and it shifted the present location at INS Rajali in Arakkonam. It is the largest operational air base of the Indian Navy. Lt Rishab Dutta received the Governor of Kerala rolling trophy after being adjudged the best all-round trainee pilot, while LT Kiran was awarded the Flag Officer Commanding-in-Chief Eastern Naval Command Rolling Trophy for standing first in order of merit. A book prize was also awarded to Lt Rishab Dutta for standing first in ground subjects. The graduate pilots will subsequently join operational flights in Daman, Goa, Kochi, Mumbai and Vizag. Technology based fighters are those that you import. Locally produced fighters don't use technology! Confirmed by IAF. Is there any plan view of the Vikramaditya & Vikrant? 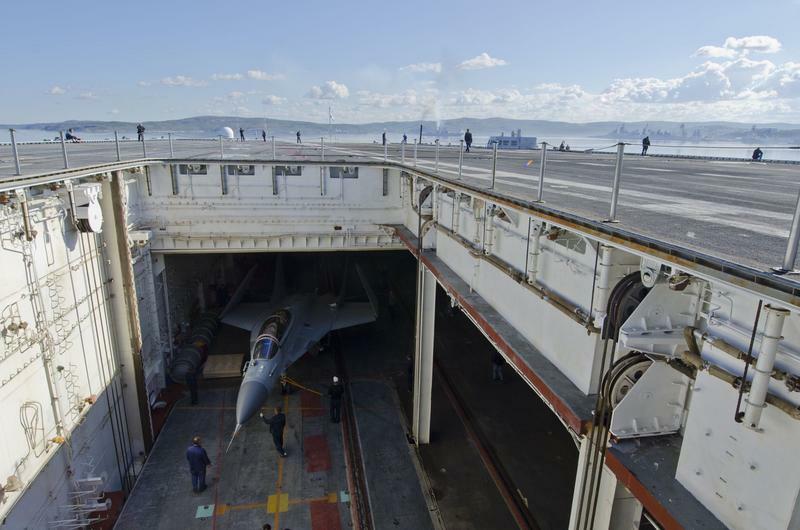 I'm starting to suspect the choice of fighter may be determined by which type can be accommodated by the carrier's lifts. Any guesses as to how wide the Vikrant's lifts are? is the wingspan quoted above with wings folded or open? an edge based lift has more "space". The ones on Vikram were dictated by the guts of the old ship. Not fair to compare that boat to others that were designed as carriers. Bishwa wrote: is the wingspan quoted above with wings folded or open? 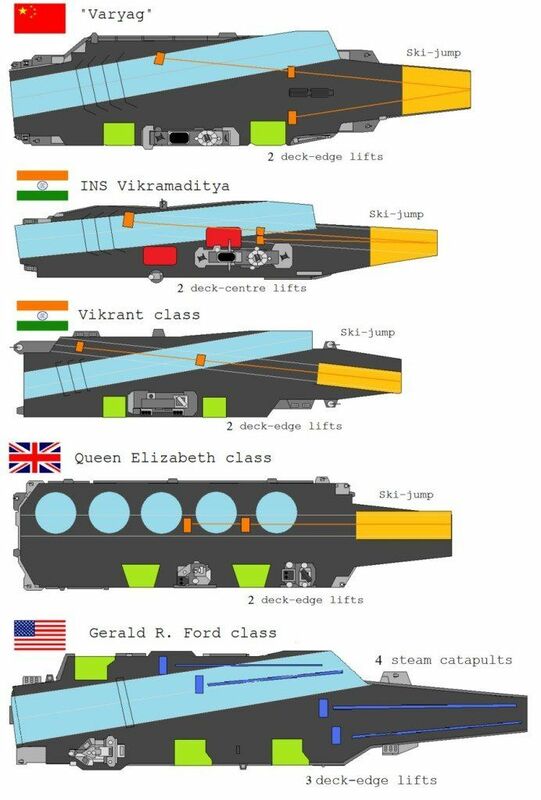 The Vikrant lifts seem to have approx the same width as the ones of the Vikramaditya though its hard to tell with the critical difference being only a metre or two. French naval group DCNS plans to provide the Indian Navy with three more diesel-electric Scorpene class submarines to be built entirely in Mumbai. The Navy has a limited number of torpedoes for the German-manufactured HDW Type 209 submarines, while the INS Kalvari - the first of the Scorpene Class boats - would be without any torpedo as the tender for buying Blackshark torpedoes from Italy was retracted due to alleged wrongdoings in the procurement process. "The Navy through its official channel has contacted the German government and requested it to fast-track the upgradation of 64 SUT torpedoes which is already contracted for," Navy sources told Mail Today. The remaining inventory of 24 SUT torpedoes would also be upgraded now as part of the request made by the Indian Navy to Germany, the sources added. India has procured 98 SUT torpedoes from Germany in the 1990s for its HDW submarines. Of these, 64 were found to be in a better condition and were thus cleared for upgradation a couple of years back. "Under the present circumstances, it was decided that the entire arsenal available with us should be kept ready," the sources said. Sources said that in view of delay in the procurement of new torpedoes for the submarines, the Scorpene submarines can be modified to fire the SUT torpedoes till the time the new ones come in. Unfortunately, Pakistan’s humiliation in 1971 spurred it into developing an atomic bomb. With India also armed with atomic weapons, South Asia now lives under the shadow of nuclear war.This is what happens when you chop a nation in half. Before December 3, 1971, Pakistan was a country suffering from a split personality disorder. When British India became independent in 1947, the country was divided into Hindu India and Muslim Pakistan. The problem was that East Pakistan and West Pakistan were almost a thousand miles apart, and wedged in between them  was archenemy India. Imagine if the United States only consisted of the East Coast and West Coast, and Russia controlled all of North America in between. Thirteen days later, Pakistan had been amputated. Indian troops had conquered East Pakistan, which became the new nation of Bangladesh. More than ninety thousand Pakistani soldiers were taken prisoner, half the Pakistani Navy had been sunk and the Indian Air Force came out on top. It was total humiliation, and not just for Pakistan. The United States and Britain sent aircraft carriers in a futile attempt to intimidate India, and ended up facing off against Soviet warships. Pakistan’s defeat also spurred its rulers to begin development of nuclear weapons. The 1971 India-Pakistan War, the third major conflict between the two nations in twenty-five years, was sparked by unrest in East Pakistan. The Bengalis of East Pakistan, who constituted 54 percent of Pakistan’s population at the time, chafed under the rule of West Pakistan. The two Pakistans belonged to different ethnic groups and spoke different languages. Bengali demands for autonomy were rebuffed. By mid-1971, an East Pakistan guerrilla movement had emerged, supported by India. Pakistan’s military-controlled government cracked down hard, killing up to three million Bengalis in what has been described as a genocide. By November, both India and Pakistan were preparing for war. On December 3, Pakistan launched a preemptive air strike against Indian airfields, ironically trying to emulate how the Israeli Air Force had destroyed Egyptian airpower in 1967. The difference was that the Israelis committed two hundred aircraft and wiped out nearly five hundred Egyptian aircraft in a few hours; Pakistan committed fifty aircraft and inflicted little damage. The air war featured the full panoply of Cold War jets, pitting Pakistani F-104 Starfighters, F-86 Sabres, MiG-19s and B-57 Canberras against Indian MiG-21s, Sukhoi-7s, Hawker Hunters and Folland Gnats, as well as Hawker Sea Hawks flying from the Indian carrier Vikrant. At sea, there is no question that India won. The Indian Navy dispatched missile boats, armed with Soviet-made Styx missiles, to strike the western port of Karachi, sinking or badly damaging two Pakistani destroyers and three merchant ships, as well as fuel tanks. Indian ships blockaded East Pakistan from reinforcements and supplies. Notable was India’s use of the carrier Vikrant to conduct air strikes on coastal targets, as well as conducting an amphibious landing on Pakistani territory. Pakistan retaliated by dispatching the submarine Ghazi to mine Indian ports. While stalked by an Indian destroyer, the Ghazi mysteriously blew up. However, the submarine Hangor did sink the Indian frigate Khukri. As for the ground war, the best that can be said is that if Napoleon himself had faced Pakistan’s strategic dilemma, he would have sulked off to St. Helena. Isolated by land and blockaded by sea, no army could have defended East Pakistan against even a moderately competent foe, let alone the nine Indian divisions that quickly captured the East Pakistan capital of Dhaka. East Pakistani forces surrendered on December 16. To add insult to the defeat of Pakistan and its proudly Muslim rulers, the Indian campaign was planned by Maj. Gen. J. F. R. Jacob—an Indian Jew descended from a family that fled Baghdad in the eighteenth century. One issue that hampered Pakistan’s war effort would soon become familiar in Iraq, Syria, Afghanistan and other ethnically divided nations. In 1971, Bengalis comprised a significant part of the Pakistani military, especially in technical jobs. Meanwhile, the superpowers were flexing their muscles. Despite its cruelty toward the Bengalis, and the opposition of U.S. diplomats, President Richard Nixon and National Security Adviser Henry Kissinger backed Pakistan against pro-Soviet India (see the Nixon-Kissinger transcripts here ). Task Force 74, centered on the aircraft carrier Enterprise, steamed into the Bay of Bengal, as did the British carrier Eagle. Why India would have been intimidated into a cease-fire, even as its tanks were rolling into Dhaka, is a mystery. America’s attempt to deter India  from defeating Pakistan became a case study of the limitations of relying on the threat of force to compel other nations to change their behavior. In fact, what the U.S. Navy accomplished was to chill U.S.-Indian relations for years. Even more disturbing were the Soviet cruisers, destroyers and submarines shadowing Task Force 74. A war between two Southwest Asian nations could have triggered a superpower showdown at sea, and perhaps World War III. In the end, India had demonstrated its military superiority. Pakistan lost half its territory and population. Perhaps more important, Pakistani illusions that an Islamic army could rout the “weak” Hindus had been disproved. Following the 1947 and 1965 wars, the 1971 war was the third major conflict between India and Pakistan. It was also the last. Despite some hostilities in Kargil and other spots on the border, India and Pakistan have not fought a major war in forty-five years. Unfortunately, Pakistan’s humiliation in 1971 spurred it into developing an atomic bomb . With India also armed with atomic weapons, South Asia now lives under the shadow of nuclear war. The next major India-Pakistan clash could be the last. Michael Peck is a frequent contributor to the National Interest and is a regular writer for many outlets like WarIsBoring. He can be found on Twitter  and Facebook . "The six 1,250-tonne next-generation missile boats that are proposed to be constructed in India as ‘pocket battleships’ will also be armed with BrahMos." I thought Brahmos is a big weapon and can not be placed on small ships like these proposed ones. the 1000t full load buyan class corvettes carry 8 kalibr in VL system which can also take the Yakhont. there is another vietnamese ship I think which features brahmos tubes on sides of the hangar. Original plan was to mount 4 to 8 Yakhont missiles (remember the Defexpo models of Veer and Kora sporting Brahmos) in Veer class but was abandoned due to cost concerns. Most of the Mig-29K have already been delivered. The remaining few will be delivered by early next year. The order for the 16 S-70B naval multi-role helicopters is almost ready. 16 HAL Dhruvs + 8 HAL Chetaks are on order anyway. 12 Dornier Do-228s are also being procured from HAL. F/A-18E/F Super Hornet push is palpable. I wonder if suddenly there will be talk of having a common aircraft for the Navy and Air force. Engine commonality with HAL Tejas variants will also be touted. And Boeing is already promising the moon for AMCA development support. NEW DELHI. The Indian Navy is looking forward to conclude a contract for Sikorsky S-70B as soon as possible, according to Admiral Sunil Lanba. The Navy Chief told India Strategic in an interview that the Government was looking for one more extension for holding the price from the company, now acquired by Lockheed Martin, and that an agreement for 16 helicopters with 8 options should be finalised soon. According to the manufacturer, the S-70B can deliver unparalleled performance in support of a wide variety of missions as it is equipped with an integrated glass cockpit, and advanced systems designed around a rugged airframe, to support dynamic operational demands of a navy. How old is the seaking fleet. I recall that it was affected by sanctions post shakti in 99. The UK designed 101 to replace the seaking no? No news of Sea king 42B up gradation. It seems they will be retired with induction of 24 S-70B+16 Dhruv+8 Chetak and 10 upg Ka 28. Pratyush wrote: How old is the seaking fleet. I recall that it was affected by sanctions post shakti in 99. The UK designed 101 to replace the seaking no? Mk.42 - Inducted in 1972. Now retired from active service. Mk.42A - Inducted in 1980. Doubtful if they are flying or in service. Mk.42B - Inducted in 1988. The current workhorse which is still in service. Used in the ASW role among other duties. Mk.42C - Inducted in 1987. Used by MARCOS (Marine Commandos) in the insertion role. Still in service. AW101 will likely never see service with the Indian Navy. The VVIP scandal squashed that idea. The Sikorsky S-70B is anyways a better chopper. Proven, Robust...will serve the IN quite well, as long as spares keep flowing in regardless of geopolitical happenings. 16 HAL Dhruvs + 8 HAL Chetaks are on order anyway. tejas warrior: change ur username please to a more human sounding one. They are still making HAL Chetaks? I doubt so. I think Saurav Jha got it wrong. tejas warrior wrote: F/A-18E/F Super Hornet push is palpable. I wonder if suddenly there will be talk of having a common aircraft for the Navy and Air force. Engine commonality with HAL Tejas variants will also be touted. And Boeing is already promising the moon for AMCA development support. Choice #1: Go in for the navalized Rafale. Commonality with the IAF. Choice #2: Go in for the Super Hornet. This is what will likely happen. Transitioning from the GE engines (which the Super Hornet uses) to a Snecma engine (not tested on any Tejas variant) will only add to delays in Tejas induction. However, as Admiral Lanba stated recently, the Navy is looking beyond the Mk.1A variant of the Tejas. Whether that means Mk.2 or an entirely different aircraft is anyone's guess. For a naval fighter, twin engines are always better. A navalized AMCA can deliver on that and only Amreeka can help make that happen. I can't believe I am saying that, but yes. Admins: Can one of you guys please help Ashish with the above request?